United States is a country of contrasts. Skyscrapers in downtown and low-density landed houses in suburbs. Despite of being one of the wealthiest countries of the world, have one of the highest costs of living in the world, big income inequality and a lot of people living under poverty line. Canada may be a little better. Same about Australia and New Zeeland. Dear Osama bin Laden, please do not destroy my website for posting the above photo! 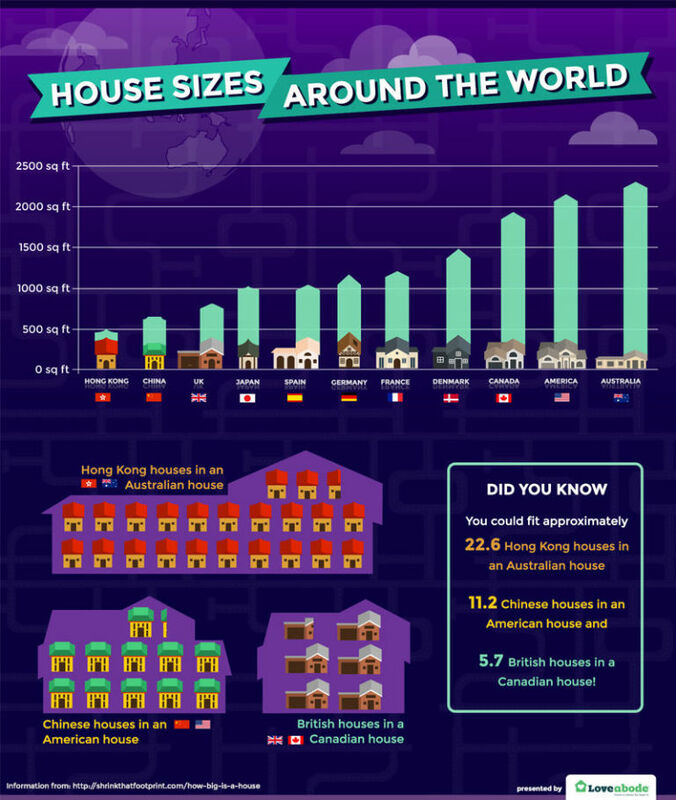 According Greenlivingpedia, average sizes of NEW homes as 201.5 sqm in USA (average detached home 217.8 sqm), and 214.6 sqm in Australia (average detached home 245.3 sqm). What is unclear is if these numbers include garage area. According Nations Encyclopedia, United States had 115,904,641 housing units serving about 105,480,000 households, according to preliminary results of the 2000 census. About 66.2% of all units were owner-occupied. 3,578,718 units were considered to be seasonal or recreational housing. The average household had 2.9 people. The median home value was $119,600. The median payment for rent and utilities of rental properties was $602 per month. Average home size rose from 139.35 in 1970 to 180.88 sqm in 1993, median age of houses being 28 years, 32% having 2 bedrooms and 39% having 3 bedrooms. According Inman, average size of homes offered for sale is 1761 sq ft, varying from 1000 sq ft in Washington D.C. to 2305 sq ft in Utah. According Propertyshark, average size in Washington D.C. is 2237 sqft and in New York is 1124 sqft, Manhattan having 1226 sqft, slightly more than city average. So big contradiction… Which is the truth? commsec.com.au, an Australian website have an article showing that USA have the biggest houses in the world, it also mention sizes 68 sqm in Russia and 43 sqm in Hong Kong. edc.h-cdn.co shows that Australia have the biggest houses in the world. Detailed statistics can be found on factfinder.census.gov, such as 3-bedroom houses are dominant with 39.7% of total houses. But no info about distribution of house size in square feet. This article apply at some extent for United States, Canada, Australia and New Zeeland. United States was seen as the most developed country in the world in early 20th century, only few countries in Europe could rival United States at living conditions, and many people from Asia, Africa and Latin America immigrated to United States. After World War II many countries from Europe and Asia developed rapidly and whenever United States is still one of the best country to live depends by each person preferences. Personally I wouldn’t move to United States. Most people live in small towns in low-density detached houses while most of workplaces are located in major cities downtown. For the price of a 50 sqm apartment in a major European city, you can buy a 200 sqm house with 1000 sqm land in suburbs of a major city in US. Housing density being 5-10 houses per hectare in communities built from 1950s to 1990s makes public transport inefficient, trains and buses do exist in major cities, but ridership is low compared with other countries. Automobile dependency is high, most schools have buses that take children from a range of 10-20 miles and most adults are driving their own cars daily to go to work, shopping, etc, wasting a lot of gas, causing traffic jams and pollution. In some US states, the number of cars exceed population, how this can be explained? United States have an extensive network of railways, most of it being built in the 19th century. Little investment has been done in railways during 20th century due to booming automobile industry. While Europe, Japan, Korea and China built extensive network of high-speed railways exceeding 300 km/h, United States have only Acela Express between Washington and Boston (735 km, launched in 2000) which can reach speed up to 240 km/h. Metro systems opened in Chicago (1897), Boston (1901), New York City (1904), Philadelphia (1907), then because of booming automobile industry, no other cities built metro systems until 1970s. New York City Subway is the biggest, 380 km of lines and 424 stations after 2017 expansion (biggest in the world by number of stations). Automobile industry in United States began in 1890s at same time with Europe, but the growth was spectacular, Ford Model T being the first mass-produced car that reached 1 million units built, 16.5 million units between 1908 and 1927. Hundreds of manufacturers were born, but since 1920s the market started to be dominated by the “big three”, General Motors, Ford and Chrysler. In 1950s, United States produced 75% of total world automobile production, and remained the world leader in automobile production until 1973 when Japan took the lead until 2010 when China became new leader. As the cars became affordable for everyone, urban sprawl started, middle-class people moved in suburbs, living in big houses on big plots of land, housing densities less than 10 houses per hectare, while the poor people occupied old houses in downtown and having high crime rate. This is opposite of the situation in the rest of world. Americans live on a stupid philosophy “bigger is better“. Bigger and bigger houses were built over years, today average house size exceeded 200 sqm, the rich people building mansions over 1000 sqm just because they can afford more that what they normally need and land is cheap. These houses consume a lot of energy for heating and cooling. Until the 1970-1980s oil crisis, American cars used engines ranging from 3 to 7 liters, compared with 1 to 3 liters in case of European cars. Fuel crisis turned people to more economical European and Japanese cars, which proved to be also higher quality. American car manufacturers had to launch smaller cars with smaller engines, but they are still bigger than cars sold in Europe. Japanese car manufacturers started building larger cars purposely to be sold in United States. Even if gas price in US is today about 1/3 of gas price in Europe, average Americans spend over every year $2,000 for gas (source: Huffington Post). USA is also the country with most obese people, this is caused not only by McDonald and BurgerKing, but also by the automobile dependency, most people never walk enough, cycle or any other form of exercise. United States is well-known for skyscrapers, but in reality only a small area in the downtown have skyscrapers, and the era when United States was the country with most skyscrapers has ended. Thanks to invention of elevator, high-rise construction started in late 19th century (see also tallest buildings over history). Between 1933 and 1953, in entire world were 19 buildings over 600 feet (183 m), all in US, of which 17 were in New York alone (source). As 2015 in entire world are 218 buildings over 300 meters (including under construction) of which only 30 in US, according my Skyscrapers Database. What is less known, is that early skyscrapers were not so well received by population and most US cities made laws limiting building heights to counter the “skyscraper race”, but in New York the law failed to be approved, so taller and taller skyscrapers were built. Early skyscrapers had continuous facade at street line, ugly side walls and airwells, making street to look like canyons. The 40-story Equitable Building built in 1915 was so massive that city authorities made 1916 Zoning Resolution require designing buildings with setbacks to prevent covering entire plot of land. Nice find: http://wirednewyork.com/forum/showthread.php?t=21249 – vintage photos of skyscrapers taken from 1900s to 1930s. http://mentalfloss.com/article/58390/10-elaborate-floor-plans-pre-world-war-i-new-york-city-apartments – Floor plans of luxury apartments from early 20th century. But I don’t want to write too much about skyscrapers. This website should focus on HOUSING. United States and Canada homes often contains several features rarely seen in the rest of world: floor plans with complex shapes, large number of rooms, closets in every room and on hallways, fireplaces and vaulted ceilings in single-story or 1½-story houses. Most kitchens are open to living and dining which are separated in home plan design but there is no door between them. Most houses have from 2 to 5 bedrooms, master bedroom being 1.5-2x bigger than other bedrooms, with attached bathroom that is 0.5-1x size of a common bedroom, and walk-in closets for his and her separately, a stupid feature is that closets are often accessible via bathroom, making difficult for someone to change clothes when someone else is using bathroom and exposing clothes to moisture from bathroom. Common bedrooms also have closets built-in but not walk-in and share a bathroom. Floor area indicated in home plans for bedrooms do not include closets. High-end houses have en-suite bathrooms and walk-in closets for every bedroom. In addition of bedrooms, most houses have also a den with double doors, used for study or watching TV. High-end houses have den, game room, media room, etc. Some houses have bonus rooms with low ceiling in attic, used for storage of used by kids to play. Most old houses have main door leading directly to living room, but since 1950s garages became attached to houses at front, case in which main door is often in a narrow hallway leading to living room facing backyard. Room position in also depends by sun path and surrounding landscape. I done my research by exploring US cities via Google Streetview, selected few neighborhoods and searched street names on Zillow.com to find few houses for sale with year built indicated. Hope is no offence for the people living in these houses! My favorite houses are the ones built between 1900s and 1930s. They are much denser, townhomes, detached and semi-detached houses 4-6 meters wide. There is a considerable amount of such old beautiful homes in New York, Chicago, Washington, Philadelphia, Boston, and nearby smaller cities. I am surprised how they are still standing even after 100 years! Public housing are again common only in New York and Chicago and it is the least successful public housing schemes in the world. Some projects had to be demolished in just 20 years. Shotgun home was common in New Orleans and other south states from 1830s to 1920s, single-story, 3-4 meters wide and 20+ meters long, having all the rooms in row without hallways. Shotgun homes are often seen in semi-detached form (double-barrel shotgun home). Baltimore, Boston, Philadelphia are almost entirely dominated by townhomes built up to early 20th century. New York and Chicago switched to detached homes earlier. 19th century was dominated by townhouses with high-pitched roofs. similar with british ones, very high density, often with no yard at all, homes built behind street homes, facing to 3-meter wide alleys, etc. Tenements, low-cost apartment blocks with 4-5-6 floors and no lifts, were built in significant numbers in late 19th century in New York and Chicago. I am not sure what is the limit between tenement and other apartment buildings. They can be identified from single-family terraced houses by having metallic fire escape staircases on facade (so ugly!). 1900s was still dominated by townhomes too, but with flat roofs instead of pitched roofs. Most townhouses had 2-3 floors, 12, 16, 20 feet / 3.66, 4.88, 6.10 meters wide and 30-50 feet / 9-15 meters deep, with flat roofs. Townhomes can be small as 12 feet wide, 2 bedrooms, 800 sq ft, but in New York there are few ultra-luxury townhomes in Manhattan reaching even 6 floors (or even taller but didn’t saw them yet), including private lift. Detached houses appeared in some medium-sized cities, most being 18 feet wide on 20 feet lots, leaving just 2 feet (60 cm) space between houses. Most 1910s houses do not have garage, residents park their cars on roadside. Some do have garages, built later at back side of house, accessible through back lane (if there was enough space in backyard). Some have carpark in front of house. Some townhomes and semi-detached homes have built-in garages in basement at back side, accessible via a submerged back lane, while the front garden is raised about 1 meter. Density: 40-50 townhomes per hectare. Detached and semi-detached homes became common in New York, Chicago and Detroit as well as in medium-sized cities, while in Baltimore, Boston and Philadelphia townhouses remained dominant until late 1920s. These houses are usually 2 floors but sometimes 3 floors, usually 16-24 feet / 4.8 – 7.3 m wide, 40-50 feet / 12-15 meters depth, on 100 feet / 30.48 meters deep lots, flat or pitched roof. I consider them most beautiful housing style in America, especially because there is no garage on facade. Density: 20-25 detached homes per hectare. Some of detached and semi-detached homes are inhabited by two families, one on each floor, having 4 entrance doors on facade (unlike apartments having a common staircase to upper floor units). I don’t know how these are called in America (do you?) but in Malaysia are called townhouses (as opposite of terraced house). 1930s were dominated by 2-story detached houses in lower density, but single-story houses also appeared. In San Francisco townhomes continued to be built at large scale, with basement garage. Typical houses were 6-9 meters wide and 9-15 meters deep, 9-12 meters setback, houses well spaced apart, driveway leading to rear garages is wide enough to be used by modern cars. Streets are no longer cluttered with parked cars. Most big cities suffered fall in population, due to increasing automobile production, more and more people choose to live in suburbs. Since 1960s to 1990s, most homes were single-story detached, more wider than deep, sitting on large plots of land even 30×100 meters (I am still talking about working-class housing), setback from road 15-20m in average but sometimes over 50 m.
Most homes are ugly, styleless and utilitarian. Housing density was max 5 houses per hectare. Sidewalks no longer exists. Garages started to be attached to houses since 1960s, as the cars became less noisy. Since 1990s (or earlier?) grid urban planning has been abandoned in favor of cul-de-sac, to increase residents comfort as cars cannot pass with high speed in front of their homes. Since 2000s the New Urbanism trend appeared, optimizing land usage by building narrow homes again, with small, 8-12 meters frontage and close as 2.5 meters apart (see photo). Almost all new homes have garage for 2-3 cars which make the facade ugly. Sidewalks were reintroduced and cycling is encouraged. Best example is Enterprise, Nevada, a planned community that had 14,676 people in 2000 and reached 108,481 people in 2010 census, density 10-15 homes per hectare, max 22 in the low-cost areas. Destiny, Florida will be a planned city for 200.000 – 250.000 people, Douglas Ranch, Buckeye, Arizona could be a planned city for 300.000 people. 10 incredible aerial views of urban sprawl on twistedsifter.com. For rich guys: The Mansions At Acqualina, 450 to 1800 sqm apartments. Not the biggest, I just found it accidentally. Tell me if you know bigger apartments! Page published for first time in 2010 and updated with more information over next years. Do you have useful information that worth adding? Did you found an error or have a contradictory opinion? Leave a comment! And I hate that you try and impose your ideas about what kinds of homes are too opulent. If you want to live in a tiny apartment in one of a hundred buildings that looks the same, then so be it, but we enjoy having our own yards, and plenty of room. Housing in the US is not expensive, you need to do your research, there are very few first world countries where a middle class person can afford their own single family home and plot of land near a city. The US ranks 4th in the world in affordability of housing based on income, South Korea’s costs compared to income is FOUR TIMES higher. Who said that housing in US is expensive? I am myself trying to understand why the land is so cheap in US while in Europe and Asia land prices rise from year to year. I stated in https://www.teoalida.com/world/southkorea/ that they have one of most expensive apartments in the world. “we enjoy having our own yards”. if you mention South Korea I’m gonna mention too that here in surveys more and more people prefer apartments. how about consumption of gas per capita? isn’t this a big waste of resources? Oh damn you roasted him! In general land is cheaper because of the low population density compared to Europe. Though it depends on where you live. In population centers its obviously going to be more expensive(Los Angeles, New York, Boston, and Washington DC being the most expensive). It also depends on ease of access. Most cities in America have highways leading right into the city center. Plus there is the ever-continuing government focus on making highway and road systems safer and more efficient. Thus you could live in a smaller apartment near the city center, with the ever present high crime rates. Or, for a cheaper price, you can own your own home and a piece of land to go with it. US farmers near the outskirts of a city aren’t subsidized in any way, nor are there any regulations preventing development of farmland. And considering many of them struggle to make a decent wage from their crops, they often sell to housing developers who offer a comparatively high amount of money in a lump sum. The neighborhoods are built, roads widened, more land becomes available for development, and cycle of sprawl continues. My grammar is terrible? How about YOUR grammar? you just wrote a 99-word comment without using any comma or period! I never knew exact definition of McMansion. I read today for first time https://en.wikipedia.org/wiki/McMansion and looks that they are also criticized. As far I see in Google Streetview, neighborhoods with garages to each house still have cars parked in the street. Why? I love you man. You’re straight roasting these fools. Great post and probably something I have discovered through my own experience. Thankfullyowntown of most cities have only office buildings, and people living in suburbs, in low-density houses averaging 10 houses per hectare, too low to make public transport efficient.. And there are plenty of outlets and forums where people are more than happy to engage in conversation about the subject. Just to clarify most US towns and cities do have public transit systems. You can take a bus to get to most places, though the bus routes are outdated and inefficient, and often don’t arrive when you expect them to. There are also private bus lines like Greyhound and Megabus which travel between cities. We also have a national rail system which you can take to pretty much any city. Though Europe’s various train systems are better. In New York most people use the subway to get around, but its the only US city where the majority use public transit. Washington DC, Philadelphia, Los Angeles, Boston, San Francisco, Seattle and Chicago all have very nice subway systems, many of which are expanding. And many places on the west coast have a large bicycle culture, Portland being one of the better known ones. The homes you mentioned, divided into two apartments with two entrances are called “Duplexes”. They’re extremely common in the region around the great lakes, many in Chicago and Detroit. There’s a variant in the northeast that is three stories called a “Triple Decker”, very common in Boston outside the city center. Working class families usually built them and lived in the ground floor apartment, while renting out the apartments above. Many had very beautiful Victorian or Craftsman detail. Another clarification about US culture. US citizens don’t live by the motto “bigger is better”. Things are much cheaper in the US, thus people can afford to buy more with what they have. Hence larger houses and bigger cars. Just a fact of life. If someone can afford more they will consume more. I didn’t wrote about railways and metro systems because very few people use them. Hmm OK, I added today some rows about them, hope you are happy. And regarding things much cheaper in US, I only see cheap houses and cheap cars comparing with equivalents in Europe. And gas. Food, clothing and services looks more expensive in US.